Would Denver voters enact a small sales tax to build out the city’s bike network? New polling suggests they would. OnSight Public Affairs polled 621 likely 2017 voters and found that 66 percent would pay a 4-cent sales tax for every $100 in purchases (that’s 0.04 percent) to complete the citywide bike network in five years. Bicycle Colorado commissioned the poll. OnSight conducted the survey in partnership with Keating Research. Keating worked on Mayor Michael Hancock’s election campaign. OnSight has worked on various ballot initiatives, including the successful 2015 campaign to end development restrictions around Denver International Airport. OnSight co-founder Ben Davis presented the findings at Bicycle Colorado’s Moving People Forward conference Monday. 66 percent of people would pay a small sales tax to fund a citywide bicycle network. 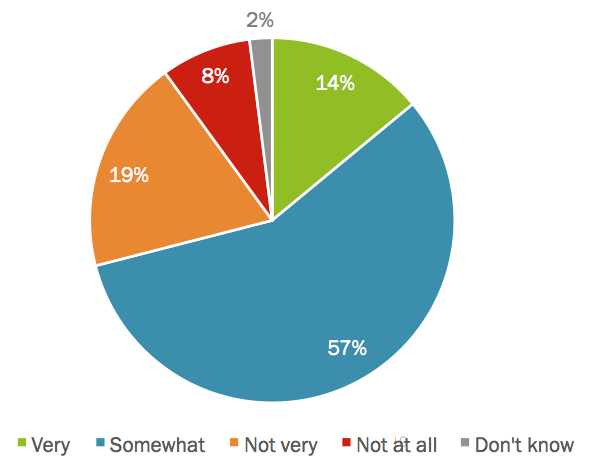 OnSight also asked people whether fewer parking spaces or car lanes would change their minds. Of the people who said they would be willing to pay the tax, 62 percent said repurposing parking and car lanes would not affect their decision. 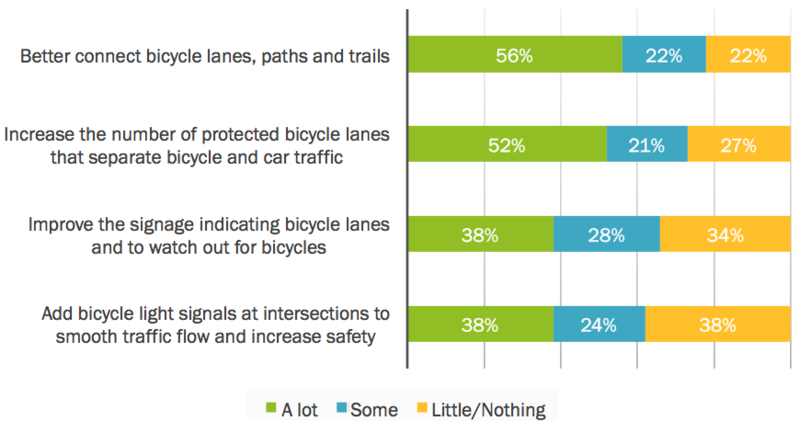 Only 14 percent of people feel “very safe” biking around Denver. When cities have a network of safe, protected bike lanes, more people will opt to bike instead of drive. With Denver’s patchwork network, only 14 percent of people feel “very safe” while biking. While a large share feel “somewhat safe,” the results suggest that Denver has a lot of work to do to make cycling around the city a stress-free mode of transportation for most people. Building out the bike network would make many Denverites more likely to ride. Denver Moves, the city’s underfunded bike plan, calls for a fully connected network with plenty of protected bike lanes that physically separate cyclists from motor vehicle traffic. If the city built out that plan, many more people would ride, the poll results suggest. Additionally, a great bike network would reduce car traffic. Pollsters asked Denverites if they would bike instead of driving if they had a protected bike lane “between your home and your workplace, or school, or favorite restaurant.” Sixty percent of people said yes — a share that rises to 85 percent among people age 18 to 34. Most people have a bike and ride it, sometimes. This article was changed to reflect who commissioned the polling. I hate to have to say this but we don’t need a new tax to pay for more and better bike infrastructure in Denver, we just need to re-prioritize our spending from SOV spending to bikes. I would like to see a sales tax on bikes and bike parts/accessories at the state level. What would you have the revenue from the bike/parts/accessories tax go towards? You would use it to fund bike projects throughout the state and get those that say “bikers don’t pay for anything” off our backs a bit. Sure, people that live on the state border might get bike stuff in an adjacent state but overall it would be a boon to biking in general in the state. As opposed to say taxing cigarettes to death and having that money go towards getting people to not start or to quit smoking. This would be a tax from bikers to make biking better. What would do better to get the ‘bikers don’t pay anything’ whiners off our backs is for them to actually understand how roads are funded (i.e. not entirely through gas taxes!). I guess I’m just skeptical that there are enough potential funds resulting from a tax to fund meaningful statewide programs, without being too onerous that everyone would just buy their replacement tubes (or bibs, or frames, or whatever) on amazon rather than the local bike shop. And sure, you have to pay sales tax on online purchases anyway, but adding another category of taxable items to that seems like a recipe for ‘too costly for what it’s worth’. I could be swayed by some numbers, though. I say making biking better benefits everyone, so let’s spread that cost around! The tax would have to be paid online too. The online vendor needs some form of presence in the state to force them to collect sales tax. Many online vendors that sell to Colorado residents can’t be forced to collect a sales tax. The people who drive only and see only that world will never be satisfied. Never, ever. Problem is we can’t even afford to keep up our SOV infrastructure with the taxes we’ve got. Maybe we could do a “TIF” style transfer, since ace lanes repurposed to bike lanes would need less maintenance and therefore save money. The savings would go to the infrastructure. Maybe not. They could afford to pay for it if they would stop expanding it. Interesting proposal though I wonder how much state support that would have. I also wonder how much money that would really be able to generate and how much would Denver be able to tap into in order to build our bike network. One thing that the pot taxes show is that Denver basically gets none of it. The advantage of a Denver tax is that Denver gets to actually use it….statewide taxes, not necessarily. I think state support would be huge, people rarely have trouble raising taxes on things that don’t raise their own taxes and most people don’t bike. It would depend on how much the tax is obviously, it has to be enough to do real good but not so much that it actually hurts bike sales (including parts/accessories). Where to spend the money is a great question, I think it should primarily be used in the places that the money comes from which shouldn’t be too hard to know. But some projects should get prioritized in places that might not have much in bike sales because it would promote biking there, increasing bike sales. The issue with a Denver specific tax is that people can easily go 10 minutes to another city without the tax. I think there is some potential with a state-wide tax, though I think we would have to view it as a potential revenue-stream that Denver could use maybe for one project here and there and not as a why for Denver to build its bike network, which the Denver-specific tax might provide. Seeing how DRCOG, Great Outdoor Colorado, Marijuana education taxes and other statewide funds go, I can tell you that there is almost an anti-Denver bias to many of these state funds and the city can only count on them as a once in a while project fund source and not as a long-term one. Hmm, are you saying that currently bike/parts/accessories are excepted from sales tax? That seems odd. So the State already collects 2.9% sales tax then and you’re suggesting an additional specific state sales tax, which is fine; I was just trying to understand. I’ll agree with that 14% number that feels safe bicycling around Denver. I think that’s really the main obstacle to increasing bicycle commuting in Denver. I happen to discuss it a lot in the elevator in my office when I’m coming and going with my bicycle. Most people complain that there isn’t a safe route from where they live to get to the DTC. If people want to give toward creating a bicycle network can’t a separate non profit agency be created that works with DPW to create the infrastructure rather than a tax system?